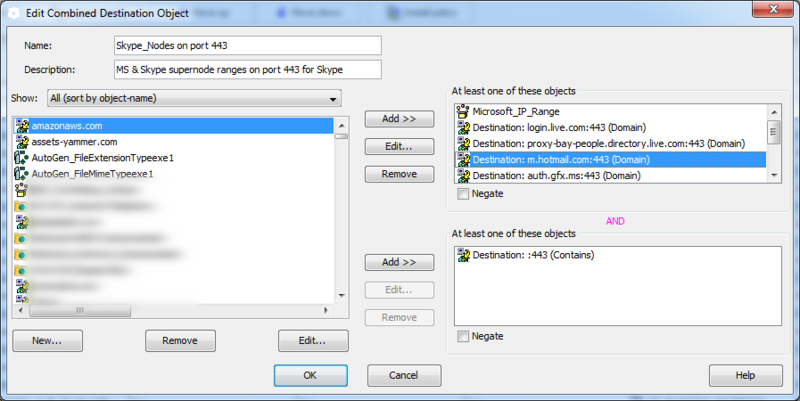 Chat using Skype and Microsoft supernodes. The initial hosts are on Skype and Microsoft owned IP addresses. Some attempts are made to reach IP addresses owned by large ISP’s. Real time traffic however did not rely on the nodes from #2. This traffic completely relies on a distributed network of ISP’s hosted nodes. I think Skype has adopted a CDN (Content Delivery Network) approach where they have supernodes installed on site at major ISP’s. Destination: Combined Destination Object && “Destination: :443 (Contains)”. Object also excludes “mail.live.com:443″, in order to not break inspection of Yahoo webmail. 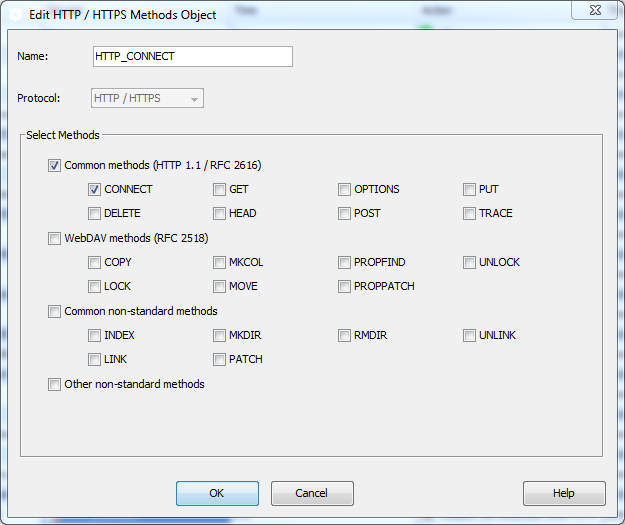 Service: HTTP/HTTPS Methods Object: HTTP CONNECT only. Action: Disable protocol (SSL) detection for HTTP Connect sessions. 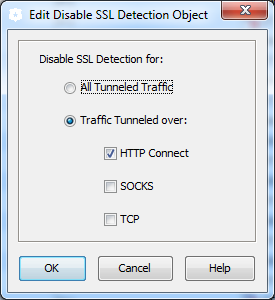 An additional rule was required to turn off SSL intercept for the same Microsoft and Skype destination object(s): A last attempt was made to try and force the Skype client to use a SOCKS proxy, as a way to single out Skype traffic. However due to the system proxy settings allowing Skype to access the internet on ports 80 and 443, Skype never tried to use SOCKS. Even using a local client application level firewall proved to be pointless as Skype circumvented it and was able to connect to the proxy server despite attempts to block it. It turns out that Skype’s model of hiding, secrecy and obscurity is hard to block let alone guide. To the point where it’s impossible to permit real-time traffic without impacting business requirements. If you’re using Lync, then a better but longer term solution would be to keep an eye on rumours(?) of some sort of Skype integration into Lync. I’m expecting this to be some sort of SIP to Skype bridge through a system plugin/API, I’m very curious what the user experience of this would be. 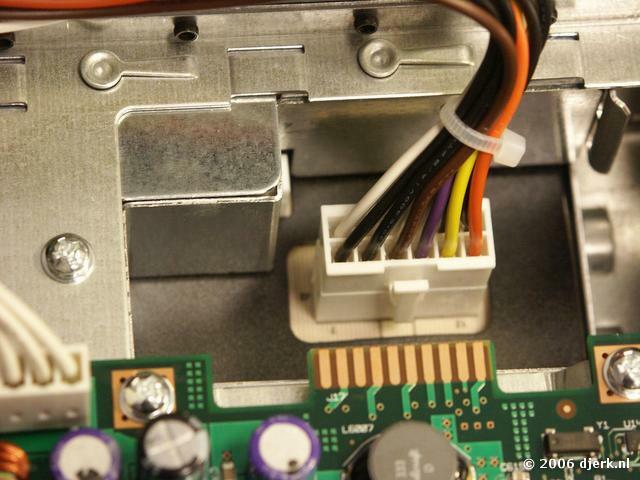 Corporately speaking this solution would solve many headaches but experience tells me it won’t be perfect.